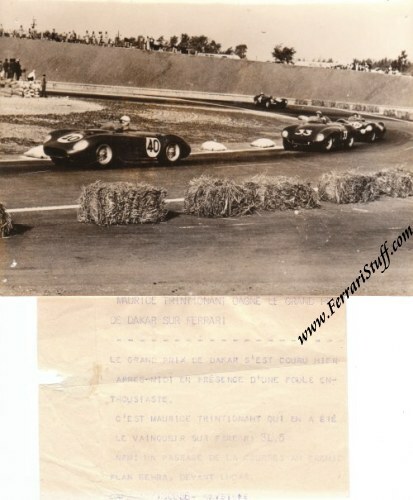 Vintage 1956 photo of Ferrari 750 Monza S/N 0440M - GP Dakar - Jean Lucas. 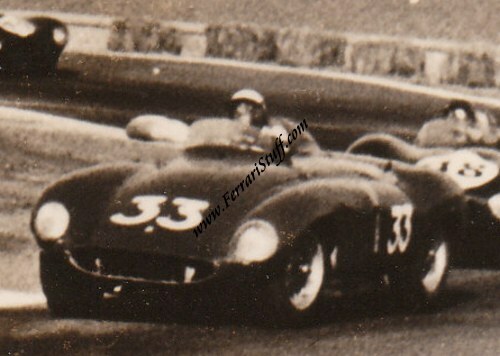 This is a vintage photograph of the Ferrari Monza 750 of Jean Lucas (# 33) en route to 4th place, following the Maserati 300 S (# 40) of Jean Behra who would finish 3rd in the 2 Hours of Dakar on March 11, 1956. The pair is followed by the # 48 Jaguar D-Type of Duncan Hamilton (S/N XKC 402 / License plate OKV 1 - DNF) and the # 49 Jaguar D-Type of Graham Whitehead (S/N XKD 510 / License plate YPC 614, 5th overall). 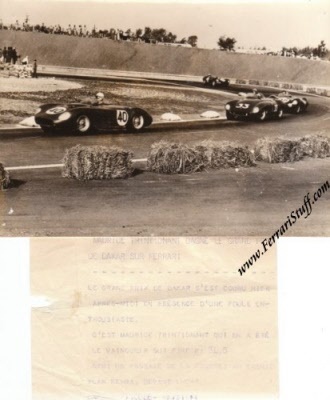 This is a so-called "wire photo" which was sent around the world by Keystone Photo from Paris France on March 12, 1956 and comes complete with a brief description as shown in the scan. S/N 0440M nowadays resides in an import collection / museum in The Netherlands. The photo measures some 18 x 13 cm or 7 x 5 inches. The back carries the stamp of Photo Keystone. Very good condition but with pinholes in the corners.